Bob Engler, owner of the local Budget Blinds franchise. If you haven’t heard of Budget Blinds of the Lowcountry, chances are good you haven’t needed window treatments any time recently. The company has established itself as the area’s go-to provider for shutters, blinds, and shades, and now it’s expanding its territory. The company plans to open a second showroom in November on Lady’s Island in Beaufort, where it will provide the same top-notch products and customer service that has made Budget Blinds the industry leader in the Hilton Head Island area. 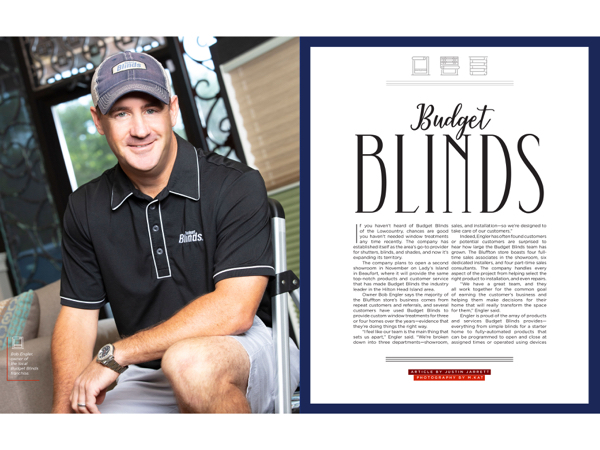 Owner Bob Engler says the majority of the Bluffton store’s business comes from repeat customers and referrals, and several customers have used Budget Blinds to provide custom window treatments for three or four homes over the years—evidence that they’re doing things the right way. Indeed, Engler has often found customers or potential customers are surprised to hear how large the Budget Blinds team has grown. The Bluffton store boasts four full-time sales associates in the showroom, six dedicated installers, and four part-time sales consultants. The company handles every aspect of the project from helping select the right product to installation, and even repairs. “We have a great team, and they all work together for the common goal of earning the customer’s business and helping them make decisions for their home that will really transform the space for them,” Engler said. Engler is proud of the array of products and services Budget Blinds provides—everything from simple blinds for a starter home to fully-automated products that can be programmed to open and close at assigned times or operated using devices such as smartphones, tablets, or automated assistants like Amazon Echo or Google Home. As the number of customers who reside north of the Broad River continues to grow, Engler saw the opportunity to better serve them—and perhaps add more—by opening a second showroom. The Lady’s Island location will be smaller (about 1,500 square feet, including a warehouse and office where a sales consultant, designer, and installer will set up shop), but it will allow the business to serve its Beaufort customers more efficiently. Customers at the Bluffton store won’t see much change, and anyone familiar with the existing store will find the same type of environment in Beaufort. The Englers took the leap into the blinds business in 2005, when Bob was ready to transition out of his career as a golf professional and try something new. The opportunity to open a Budget Blinds franchise was presented, and they ran with it. Bob’s wife, Kate, handled the marketing and advertising, and they built a team that attracted more and more customers as the years went on. It remains a family business, though, with the couple’s 14-year-old son sometimes helping the installation team and their 12-year-old daughter assisting in the showroom. The Budget Blinds showroom in Bluffton is located at 880 Fording Island Rd., Unit 8, and is open Monday-Friday, 9 a.m.-5 p.m. For more information, visit https://budgetblinds.com/HiltonHeadIsland or call (843) 837-4060.